07/07/2016 07/07/2016 LetsPlayNintendoITA2 Comments on 4th of July 2016: Last 24 hours for Springfield National Park and Teddy Roosevelt! 4th of July 2016: Last 24 hours for Springfield National Park and Teddy Roosevelt! The last 24 hours of the 4th of July 2016 promo for Springfield National Park and Teddy Roosevelt! They’ll expire on July 8th at 8am BST! Hurry up and buy them! I found the national park looks great behind Springfield Falls. We all know many buildings and decoration size ratios are out of kilt. Place the 2 storey outhouse next to Maison Derier for example…looks silly. I often compensate by trying to put items that ‘look larger’ in the foreground with items that ‘look smaller’ in the background. 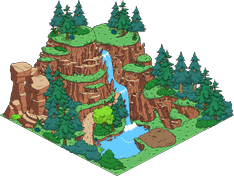 The national park looks good adjacent to Springfield Falls in this way.